Resource Tuner: How To Replace Custom Non-Standard Resources Defined by Programmer with EXE Resource Editor. A custom resource is used to store most any type of binary data within a resource file. Common data types that might be stored as custom resources are sound (WAV) and video (AVI) files. Other resource types may also be defined by the programmer and are displayed in the Resource Tree in upper case: GIF, JPG, PNG, HTML, XML. Resource Tuner allows you to extend your editing capabilities by replacing any non-standard resources in a file: TypeLib, CAB, MIDI, EXE, and more. It is important to note that editing some types of binary resources can introduce additional bytes into the resource. Such changes may cause the file to fault during execution. Unfortunately this is one of the inherent risks that comes with modifying executable files. 2. 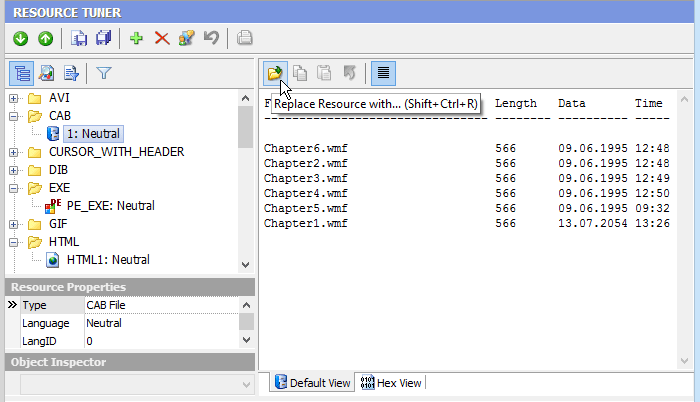 Highlight the resource item to be replaced, click on the 'Replace Resource with...' button from the button bar as illustrated below and select your file on disk. Warning! Resource Tuner cannot validate the content of the data you are loading from disk. Carelessly swapping out this data may render the modified executable inoperable. See also Command-line Resource Editor: If you need to to create a repeatable process for updating and customizing resources during the final stage of the build process.